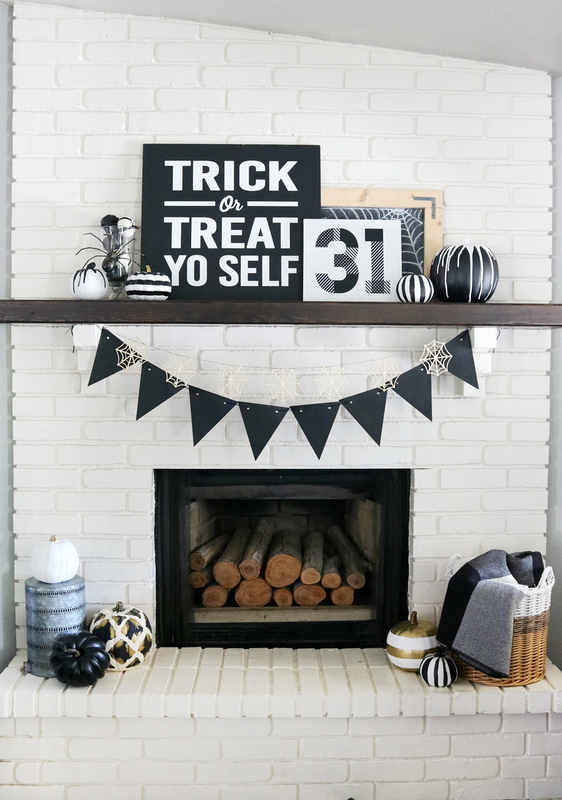 With Halloween being just a couple days away I figured it was time to share my Black & White Halloween Mantel Decor with you, better late than never right?! 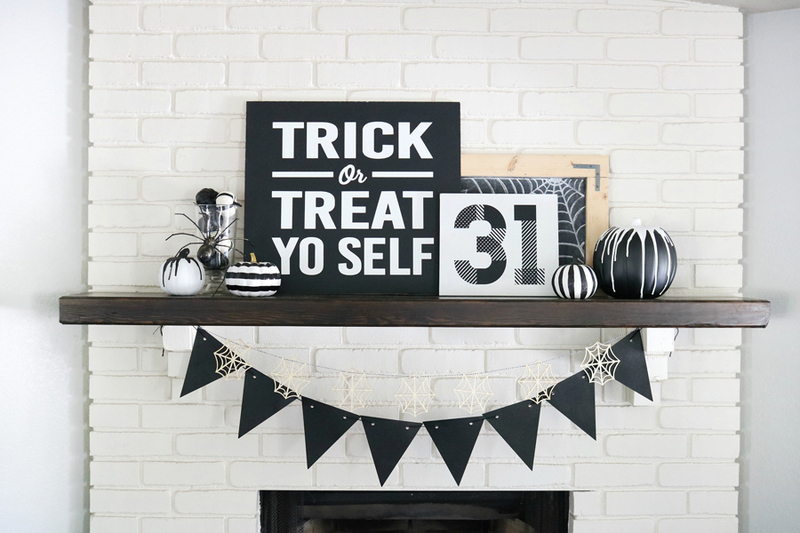 Just like last year’s Black & White Halloween Mantel I kept with a black and white neutral theme with my decor for this year. My current couch situation is super hard to decorate around and that’s why I tend to steer towards the neutrals. It’s cranberry, old and ready to be put to pasture. 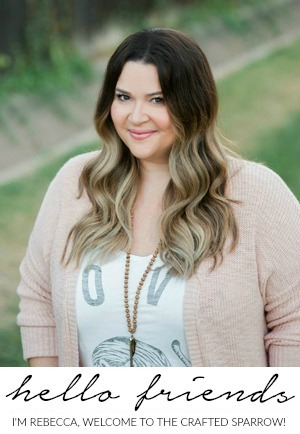 I just ordered a new sectional this week and I’m so excited to decorate around it! Plus, there’s something about black and white that make me really happy. I know I say that a lot, but it’s so true. Halloween isn’t necessarily one of my favorite holidays, I didn’t grow up celebrating Halloween so a lot of the traditions most people have I don’t. Since having kids though I’ve loved decorating for holidays, and Halloween has become one I look forward to for them. I just like to keep things on the simpler side and really don’t buy a lot of Halloween decor. 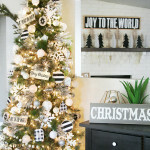 That means I am usually repurposing some decor I already have, or creating easy projects that fit my color palette. Almost everything this year is something I already had on hand. 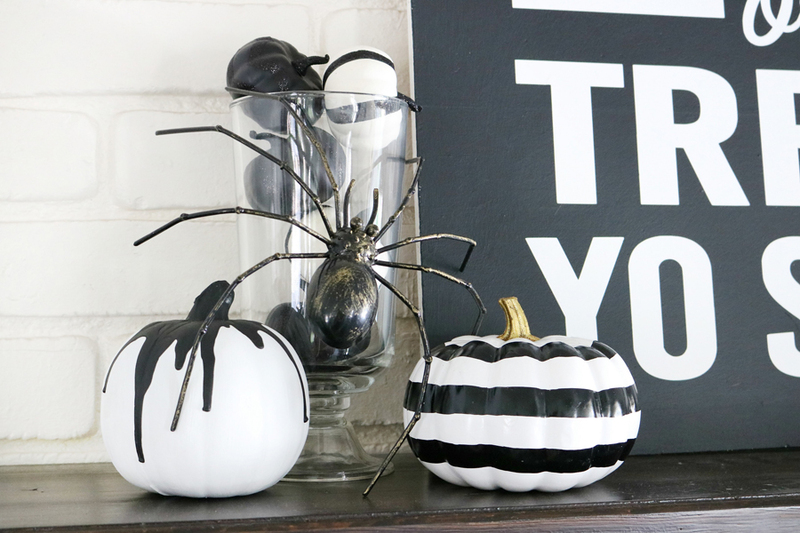 The exception being some of the small black and white pumpkins from Target like the ones in the vase, as well as the striped ones from Joanns. 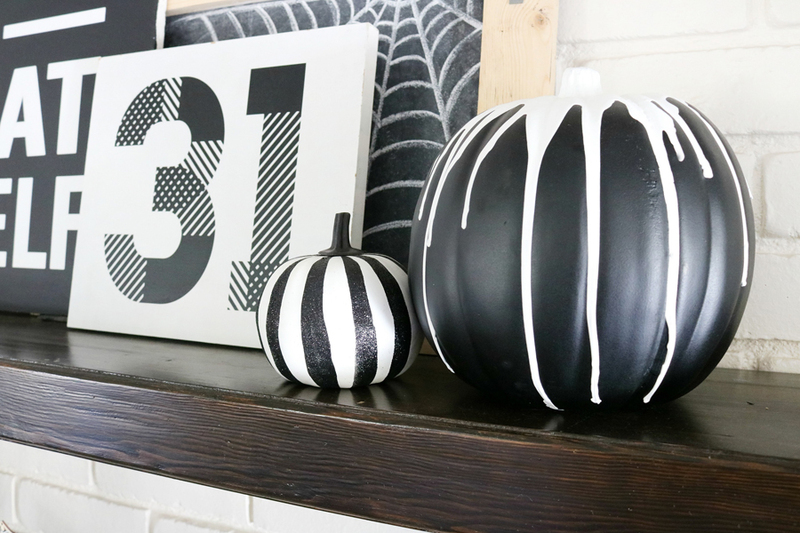 I also created some fun black and white paint dripped pumpkins using craft pumpkins I found at Michaels and target. 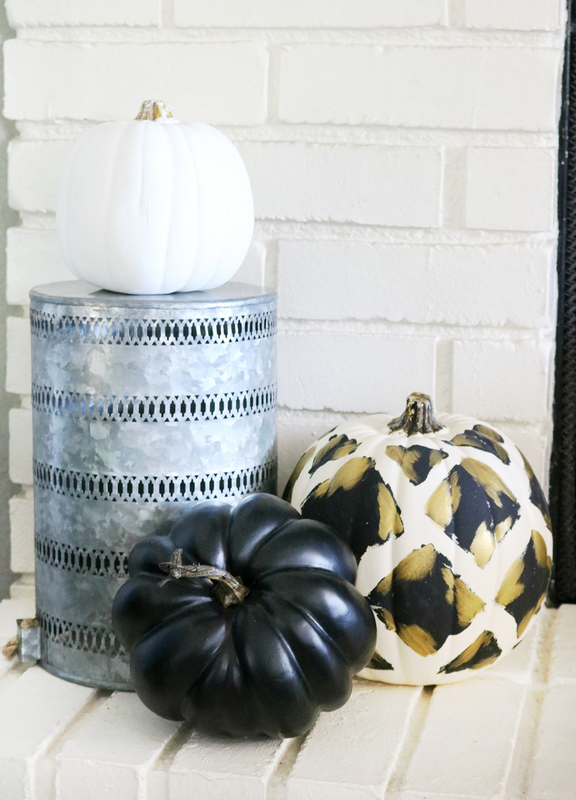 My sweet friend Taryn from Design, Dining, and Diapers has a really pretty Fall version with her Modern Metallic Pumpkins. 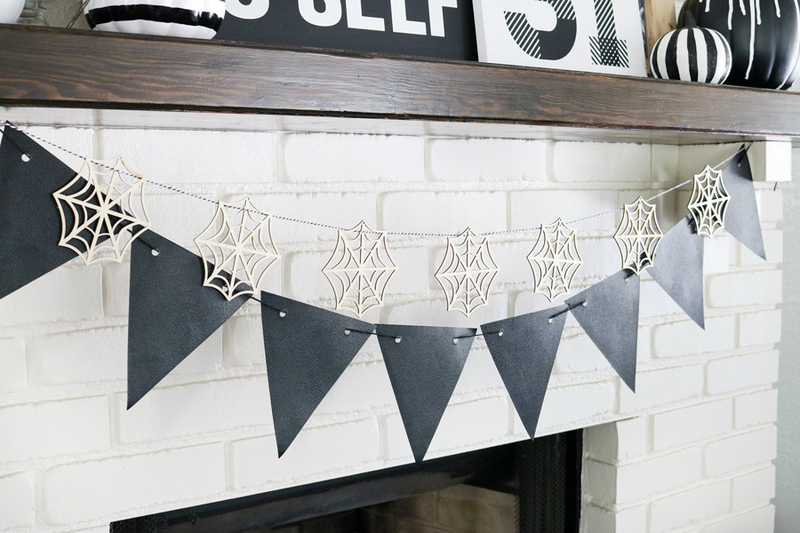 I snagged this cute faux leather pennant banner from the dollar spot at Target, it’s actually textured paper to resemble leather. I will probably reuse it again and again! 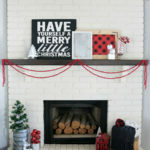 I paired it with the raw wood spiderweb garland I found last year at Michaels. 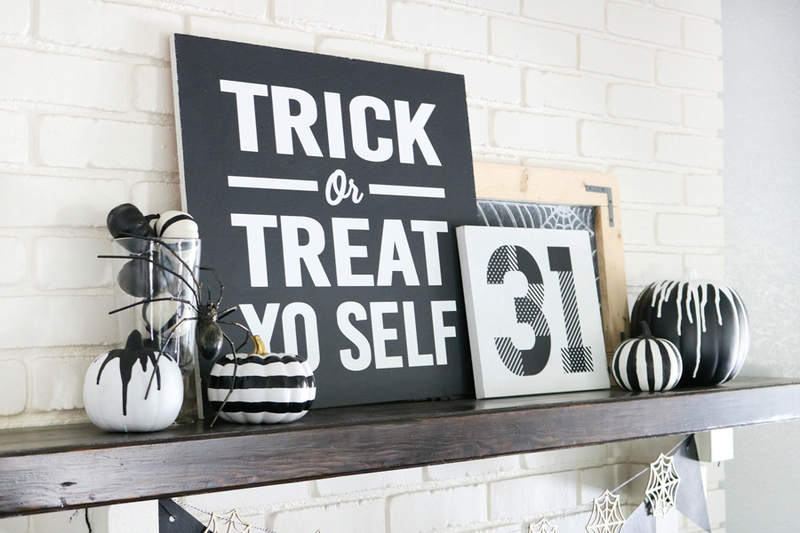 I knew I needed a cute statement piece for this year’s mantel so I created this fun “Trick or Treat Yo Self” painted sign. I had an old piece of plywood lying around and it was the perfect size for this decor. 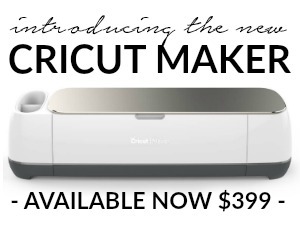 I painted it white first, then I created a vinyl stencil with my Cricut Explore Air. After applying the stencil to the wood I painted the whole sign black. Removed the stencil and viola, cute sign…zero dollars spent! 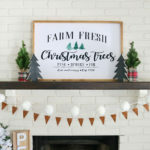 I paired the sign with a smaller wood sign I created last year again with just vinyl, and a cute raw wood chalkboard I made a few years back. 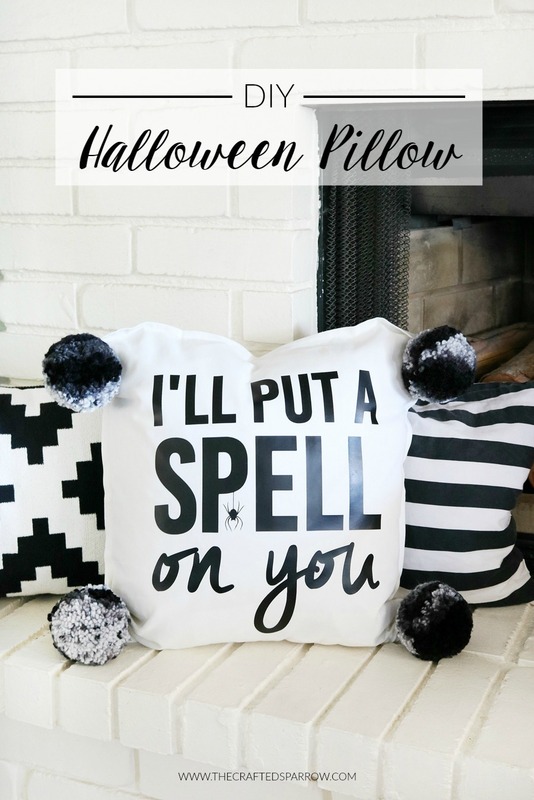 Everything goes perfectly with the fun DIY Halloween Pillow I shared a few weeks ago. Lastly, I added some of my favorite pumpkins around the hearth of the fireplace. Like my Tribal Inspired Pumpkin. 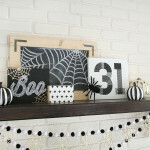 I love how this year’s Black & White Halloween Mantel Decor turned out. 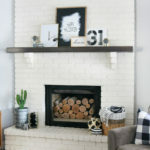 Sometimes just taking a look at the things you have around your home and how they can be repurposed is the best way to decorate.